Each year, we do a business plan for Lux. Having a plan keeps the team focused and grounded and gives us a way to measure ourselves. We’ve been doing this since we started in 2009 and we have seen good results. This summer, however, it felt time to “grow up.” It was time to start thinking long-term. 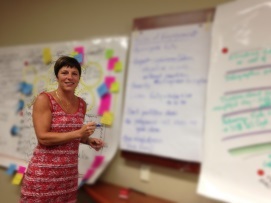 We have spent the last 3 months fleshing out our strategic planning objectives, milestones and metrics. Here are 5 key things we learned about strategic planning that you may find useful for your business. 1. Hire a strategic planning consultant. Do not try and do it yourself. Having a neutral third party is worth every penny. We used Karin Niesczeri, owner and President at Sharp Left Insights. Friendly, yet firm, Karin was the key to keeping us honest. She encouraged us to think big yet helped us keep our plan realistic. 3. Dig deep on values – they underpin your culture. Be honest. And be creative. Don’t pick values that are simply table stakes. 5. Keep a day between planning sessions so that you can take the time to reflect and re-energize. Also make sure to timebox the effort to avoid drawing out the planning when you should be executing.